Nothing is yours. Nothing is mine. We own nothing. You get onlywhat you deserve. And if you don’t get what you believe you deserve, well, that’s the way it was meant to be! Last evening we were at a music concert. It was free seating for all classes in the audience. However, by paying an extra price you could reserve vantage seats in the hall. As we settled down into our seats that were available randomly, we noticed that the two seats immediately in front of us were labelled “Mr.Brij”. There was a couple seated in them, who, we presumed, were “Mrs. and Mr.Brij”. Soon the hall filled up. We were two minutes away from the start of the show, when two gentlemen walked up the aisle, to the seats labelled “Mr.Brij”. The man was startled. Obviously, you don’t expect someone who is sitting in a seat you have reserved to be brazen about it. He politely requested the lady and her husband to get up. When they did not respond, the man went looking for one of the volunteers ushering in people. He came back with someone who seemed to be in a position of authority in the auditorium. The organizer-volunteer too appealed to the couple to get up and be seated elsewhere – among the free seats. But the couple were unrelenting. As we watched this spectacle, dumbfounded as we were by the couple’s obstinate behavior, announcements were heard asking the audience to be seated quickly to enable the concert to begin. The announcer backstage had begun to introduce the artistes now. Mr.Brij and his friend looked at the couple disbelievingly. Helplessly. Then Mr.Brij leaned over and told them: “Enjoy the show with my compliments.” There was no sarcasm. No anger. Just a plain, calm wish. He then urged his friend to walk with him. My eyes followed them as they found seats that were vacant at the far end of the auditorium. From where they were seated now, the stage would not be as well visible as it would have been, had they got the seats they had reserved. It was a significant compromise Mr.Brij had made. I am not sure he made that compromise because etiquette demanded that he did not hold up the show. From the way the couple who were squatting in his seats were behaving, had Mr.Brij been persistent and insistent, the organizers would have had to forcibly evict them. This would have surely held up the start of the concert. Or perhaps, Mr.Brij is an evolved and mature human being. Who prefers not to cling on to his position and who practices detachment. Whoever he is, Mr.Brij made me think. Would you or I have let go what – especially what is morally, ethically, legitimately – is ours? Would we have been able to practice detachment in this, or any similar, situation? The lesson that Mr.Brij’s attitude teaches us is simple. Don’t let your possessions__and positions__ruin your inner peace. The more we cling on to material assets – a premium reserved seat is certainly one of them – and/or to opinions, the more we will have to battle the world to keep our possessions secure. The world is full of people who, like that unreasonable couple in the auditorium, will encroach into your Life or will drag you into petty squabbles. They will provoke you with their brazenness. Each time you respond to their silly designs or each time you fight them to correct them or demand your due, you will squander your inner peace. Being detached in such situations is an intelligent response. Because attachments always bring misery. 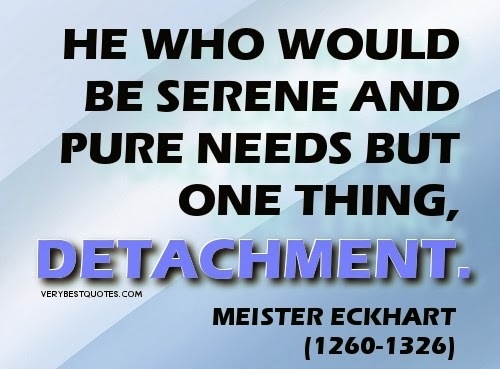 Being detached is the one sure way to experience joy! However, detachment does not mean giving up your right or not standing up for justice. It only means that you should not let what has caused you to fight, and the fight itself, to ruin your peace of mind. Always evaluate each situation when you feel outraged by such devious behavior__like that of the couple in the auditorium__by asking yourself whether your clinging on to your position will affect your inner peace. If it will, and it surely will, simply let go. It’s simply not worth it. If you, on the other hand, feel it won’t and it will benefit all parties concerned, by all means fight for what is right and what is just!